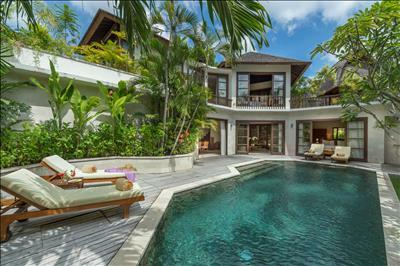 This 2-bedroom luxury villa with private pool boasts a wealth of space, featuring two large bedrooms suites with heavenly king-size beds, where light cotton mosquito netting creates the illusion of grand four-poster beds, with views of the pool and gardens through ornately-carved, antique slatted window-frames. 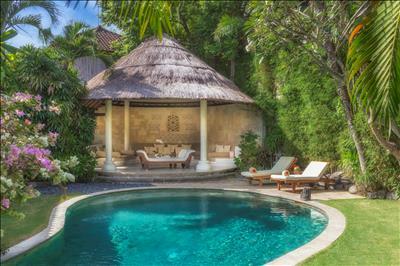 Peek through the keyhole of this tropical paradise, then step through the antique Javanese double doors to be welcomed by lush, verdant gardens with vibrant Bougainvillea and fragrant Frangipani, a sparkling turquoise blue pool and a naturally charming open-air lounge pavilion. The en-suite bathrooms are both decorated with bespoke Balinese wall carvings, deep terrazzo bathtubs and romantic outdoor rain showers. 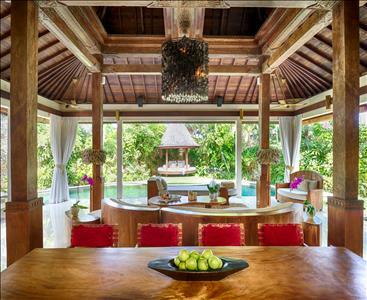 This luxury villa and its oversized, outdoor pavilion and deep, luxurious seating, harmoniously blends the traditions and magic of Bali with the all the comforts and luxury of a five-star hotel, with room service in-villa dining and spa treatments all on call. A separate outdoor dining area is designed for guests to enjoy al fresco dining, while a fully-equipped kitchen and an air-conditioned media room make this amazing retreat the perfect hideaway for two couples or a family. 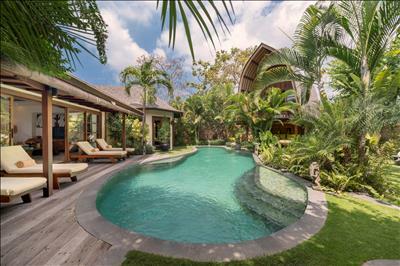 A discrete doorway in the garden allows this villa to connect to the two-bedroom Villa 1 to create four bedrooms, if desired. It can also connect Villa 14 to make five bedrooms. It was so fun my favourite thing was Waterbom and thank you for taking us to Bali. 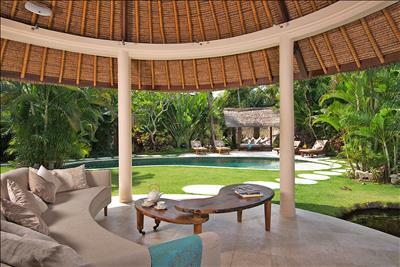 One of the best villas we have stayed. 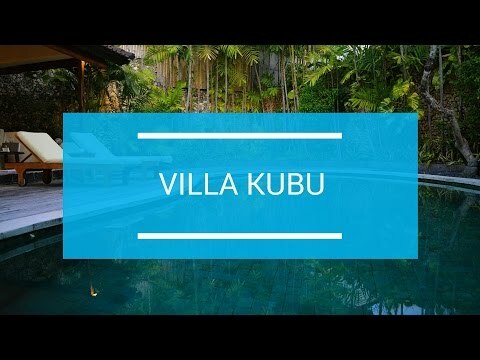 Enjoyed a lovely stay in Villa 2 at Villa Kubu. Staff and resort were fantastic. Such a wonderful stay. Will return.